Forschungszentrum Juelich, Weiche Materie (Soft Matter), Juelich, Germany. 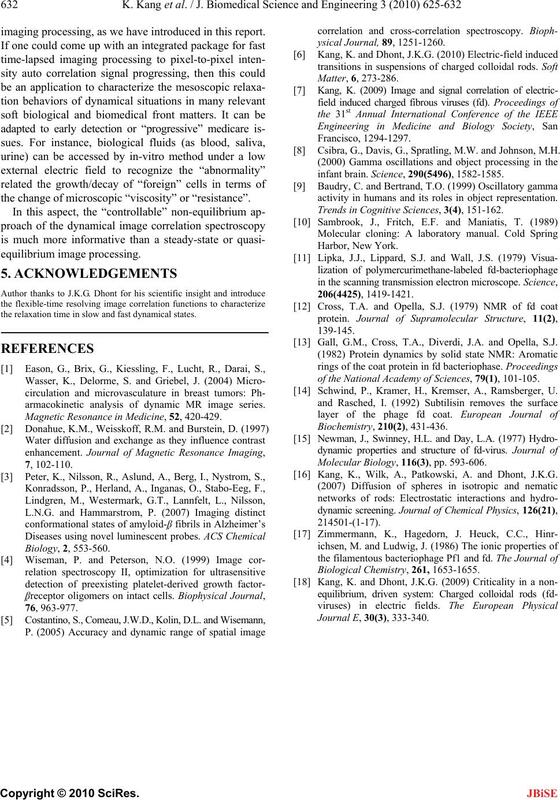 Received 16 February 2010; revised 20 March 2010; accepted 28 March 2010.
densed matter and biomedical systems. partments for early detection of malignant tumor cells. ize most biological relevant experimental parameters. in between the microscopic and macroscopic approach. size) that consist of charged fd-viruses particles. tration of P = 2200 nm, and a molecular weight of M.W. 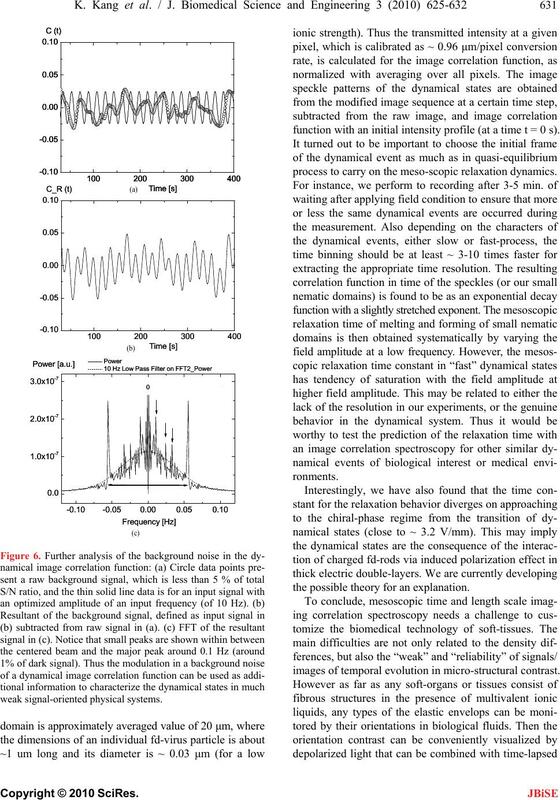 and low-angle intensity fluctuations spectroscopy . suspensions is equal to those of the osmotic reservoir. coat proteins, and not on the DNA strand of fd itself . 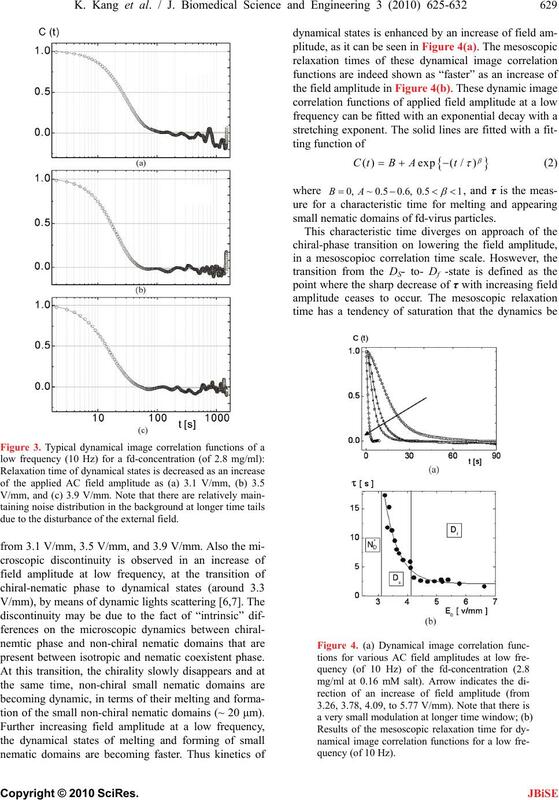 The iso-electric point of native fd is equal to pH ~ 4.2.
times smaller than the actual time of dynamical events. treated within a second as a time step. mains are quite visible in CCD pixel by pixel. event in the fast dynamical, Df -state. and “black” to “white” code. ture (as a chiral nematic, N*-phase) in depolarized light. the amplitude, as DS and Df -state, respectively. due to the disturbance of the external field. present between isotropic and nematic coexistent phase. tion of the small non-chiral nematic domains (~ 20 μm). small nematic domains of fd-virus particles. 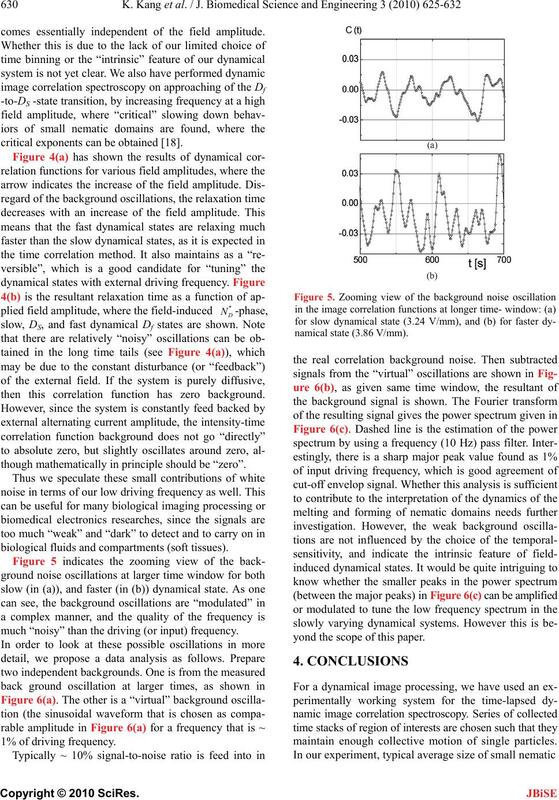 comes essentially independent of the field amplitude. critical exponents can be obtained . then this correlation function has zero background. though mathematically in principle should be “zero”. biological fluids and compartments (soft tissues). much “noisy” than the driving (or input) frequency. 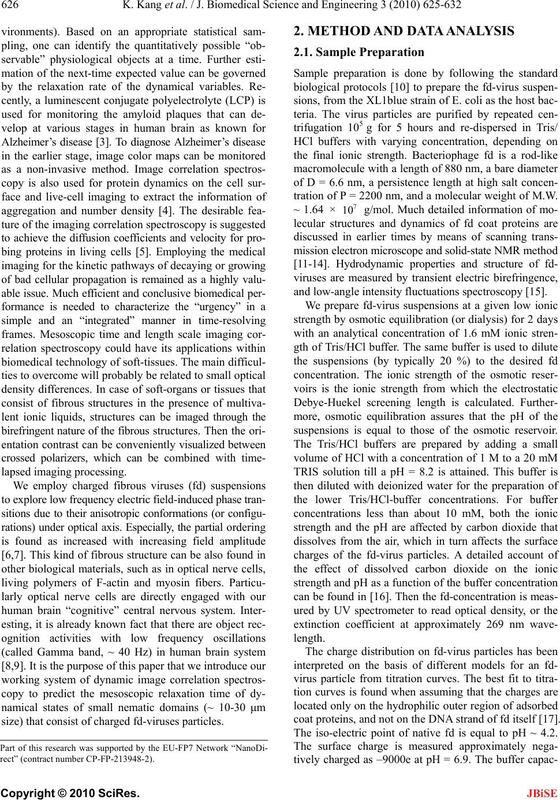 yond the scope of this paper. maintain enough collective motion of single particles. function with an initial intensity profile (at a time t = 0 s). process to carry on the meso-scopic relaxation dynamics. the possible theory for an explanation. 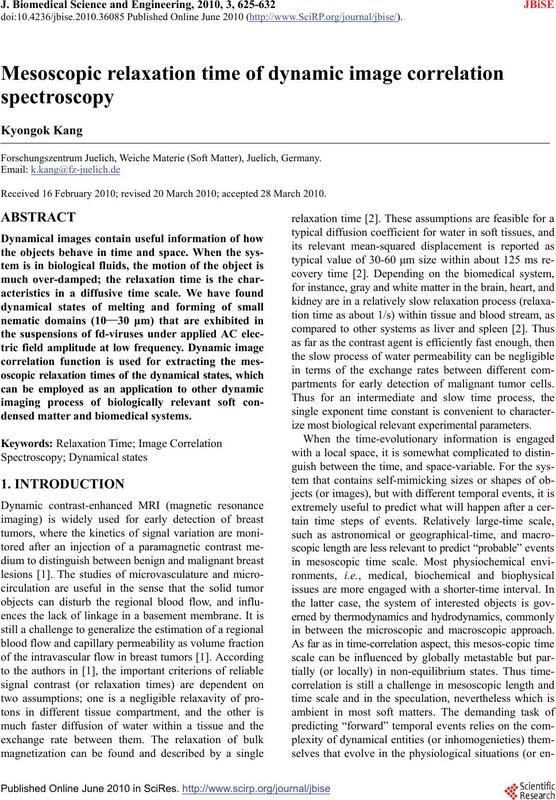 images of temporal evolution in micro-structural contrast. 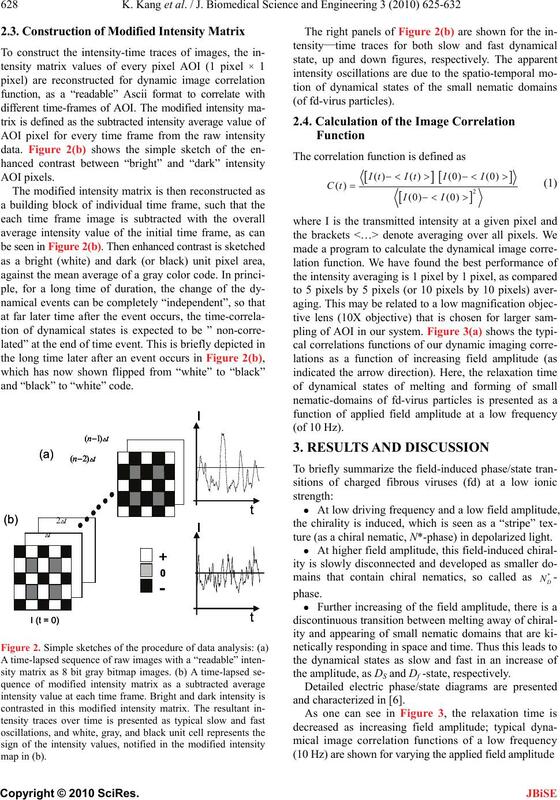 imaging processing, as we have introduced in this report. the change of microscopic “viscosity” or “resistance”. 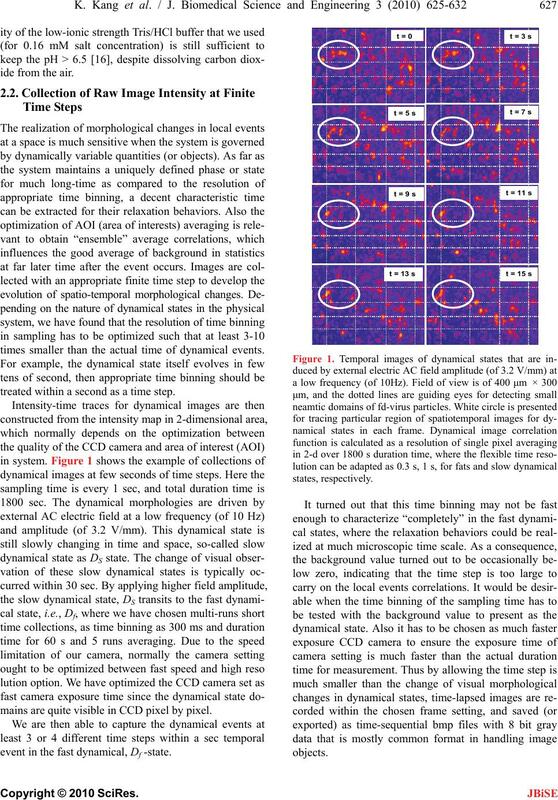 the relaxation time in slow and fast dynamical states. armacokinetic analysis of dynamic MR image series. Magnetic Resonance in Medicine, 52, 420-429. Csibra, G., Davis, G., Spratling, M.W. and Johnson, M.H. infant brain. Science, 290(5496), 1582-1585.
activity in humans and its roles in object representation. Trends in Cognitive Sciences, 3(4), 151-162. Gall, G.M., Cross, T.A., Diverdi, J.A. and Opella, S.J. of the National Academy of Sciences, 79(1), 101-105. Schwind, P., Kramer, H., Kremser, A., Ramsberger, U.
Molecular Biology, 116(3), pp. 593-606. Kang, K., Wilk, A., Patkowski, A. and Dhont, J.K.G.